French outfit Flayed is somewhat of an odd genre fit. If Deep Purple or Uriah Heep had gotten a younger, somewhat post-grunge-influenced vocalist and started writing heavier songs in recent years, that's what this would be. The members' previous experience in opening for a big roster of better-known metal bands serves them well in this case, as they amalgamate 70s proto-metal with 2000s-era modern hard rock -- and if you like Purple-esque guitar/organ duels, this band will be certain to deliver. What gets thrown out in this process are any stabs at progressivism. The songs are short and, while not exactly Top 40 material, certainly stick to business without any wandering; even the blues-drenched guitar soloing starts up and shuts down right on cue. The band can do that rolling, organ-backed, palm-muted guitar overdrive that was so popular in the 70s perfectly, and the title track's close similarity to Deep Purple blues jams like Wring That Neck can be easily excused in the midst of its excellent delivery. I wouldn't call this retro, though. Flayed's influences had spent their formative years listening to quite different music and living in a very different time, and their differences from our heroes here show on songs such as Unfairly Pure or Stanced, where all the Hammond organs and blues soloing can't change the darker and more modern flavor of the songwriting -- or vocalist Renato's gravel-voiced singing, which sometimes sounds a little odd paired with a form of music whose golden age was 40 years ago. That modernity doesn't stop the guitar work from being absolutely top-notch. Guitarists Ju and Rico put on a blistering performance, filled with fantastic blues soloing and even occasional dashes of jazz, and Rafinet, the man on the Hammond, is quite competent, though the subtle intricacy that the 70s greats combined with their heaviness seems to get lost sometimes in the attempts to sound modern-rock tough; Heat of the Sun, while it still has some good instrumental parts towards the end, spends an inordinate time inducing headaches with Renato at his most incongruous, yelling raucously over power chords. Flayed gives the impression with songs like these that they are excellent instrumentalists who have difficulty writing good, memorable songs, and there's no reason why that ought to be the case, but this makes many of their otherwise good tracks seem directionless. Unfairly Pure is an exception, in my opinion; it draws more from Stone Temple Pilots or Foo Fighters than it does from 70s hard rock, but it's got some decent hooks to go with the clever riffing. Some metal listeners might really dig this one; I know someone who's into the sleazy modern rock that makes up about 50% of the band's DNA, and paired with the sound of classic 70s hard rock bands the way it is, he'd love it. 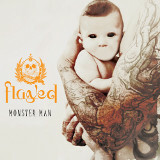 I enjoyed the majority of what Flayed is doing here on Monster Man, though occasionally their attempt to bring disparate musical elements together, like mad chemists, results in an explosion or a stink rather than the desired outcome.